Chairman Blumenthal, Ranking Member Hatch, and members of the committee, thank you for inviting me to testify today. I am an economist and senior research fellow at the Mercatus Center at George Mason University, a 501(c)(3) research, educational, and outreach organization in Arlington, Virginia. My primary research focuses on the regulatory process and how it could be improved, so I am delighted to testify on today’s topic. PPACA directs a multitude of executive branch agencies to add to this enormous body of regulations. The final version of PPACA, as published in the United States Statutes at Large, was 906 pages long, a length that attests to the fact that PPACA will lead to the creation of a potentially monumental quantity of new regulation. As such, it is appropriate to consider both the overall consequences of making that many new rules and whether those consequences might affect lower-, middle-, and high-income households differently. One focus of this hearing, according to the invitation letter I received from Chairman Blumenthal, is the human costs of rulemaking delay. I applaud the committee’s concern over how the often obscure regulatory process can lead to real human costs—costs measured not just in dollars, but also in human lives. 1. The accumulation of regulations stifles innovation and entrepreneurship and reduces efficiency. This slows economic growth, and over time, the decreased economic growth attributable to regulatory accumulation has significantly reduced real household income. 2. The unintended consequences of regulations are particularly detrimental to low-income households— resulting in costs to precisely the same group that has the fewest resources to deal with them. 3. The quality of regulations matters. The incentive structure of regulatory agencies, coupled with occasional pressure from external forces such as Congress, can cause regulations to favor particular stakeholder groups or to create regulations for which the costs exceed the benefits. In some cases, because of statutory deadlines and other pressures, agencies may rush regulations through the crafting process. That can lead to poor execution: rushed regulations are, on average, more poorly considered, which can lead to greater costs and unintended consequences.2 Even worse, the regulation’s intended benefits may not be achieved despite incurring very real human costs. Every regulation ostensibly has a goal, and there are always different ways to achieve it. There are also always costs and often unintended consequences. Careful consideration of regulatory options can help minimize the costs and unintended consequences that regulations necessarily incur. If additional time can improve regulations in this regard, then additional time should be taken. By design, regulations restrict choices. In its most basic definition, a regulation is a law that “seeks to change behavior in order to produce desired outcomes,” and it does this by requiring or forbidding certain actions.3 Federal regulations can place restrictions on the choices of individuals, large manufacturers, high-tech startups, small business owners, state and local governments, and even on the federal government itself. 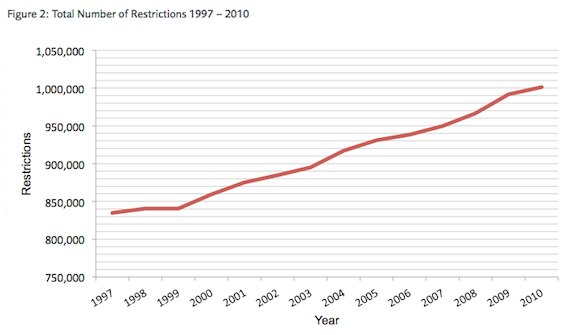 Federal regulation in the United States has consistently grown for decades. One way to measure the growth of federal regulation is to count the number of pages published each year in the Code of Federal Regulations. The Code of Federal Regulations contains the legal text of all federal regulations in effect each year. That means one can simply look at the number of pages published in the Code of Federal Regulations in a given year to get a rough approximation of the extent and complexity of all federal regulations in effect in that year. 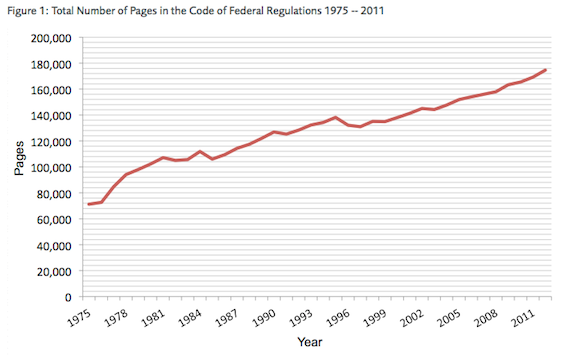 Figure 1 shows the number of pages published in the Code of Federal Regulations each year from 1975 to 2012.